May is the month of love and dating. In Drive you can get inspired by our true story about double date or a photostory Flames of Love in a glassworks. Do you know how much added sugar do you eat? You can learn what is too much and why sugar isn’t safe. Virtual reality is no more just in fantasy and science fiction. 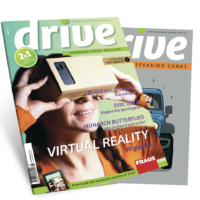 Drive is comparing three different options of VR glasses. The crossword puzzle reminds us of Mother’s Day in May! It’s April 2016, so no English language lover can forget about William Shakespeare! He died 400 years ago and still fascinates us today. Drive visits some places of his life and plays. We also travelled to far north to find a new kind of bear – the pizzly, then to Britain to interview Sandra, a tour guide who loves her job. If you wish to apply for a new job, read how to make a great CV. Did you know that infographic CVs are getting popular? 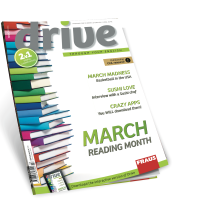 In April Drive you can learn about autism and have fun with April Fools’Day stories. March is a busy month! In March we celebrate St. Patrick’s Day, International Day of Happiness and Easter. March is also a Reading Month; you will learn how trendy reading is, about Emma Watson’s Book Club and what bestseller to pick up. If you like basketball, you shouldn’t miss the article on March Madness. 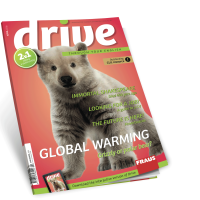 Get inspired by the new apps introduced in Drive. Are you ready for a sushi party? Drive interviewed a sushi master Petr Lambert.